No visible markings but this is the former National Lighthouse Board tender, FINGAL - IMO 5419957 (aka WINDSOR CASTLE) in Leith Harbor, Scotland on May 29, 2018. As the FINGAL, this ship was a working light house tender for 36 years. 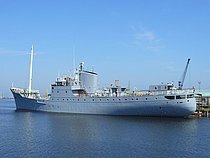 As the WINDSOR CASTLE, she was morphed into a small cruise boat for 18 years. 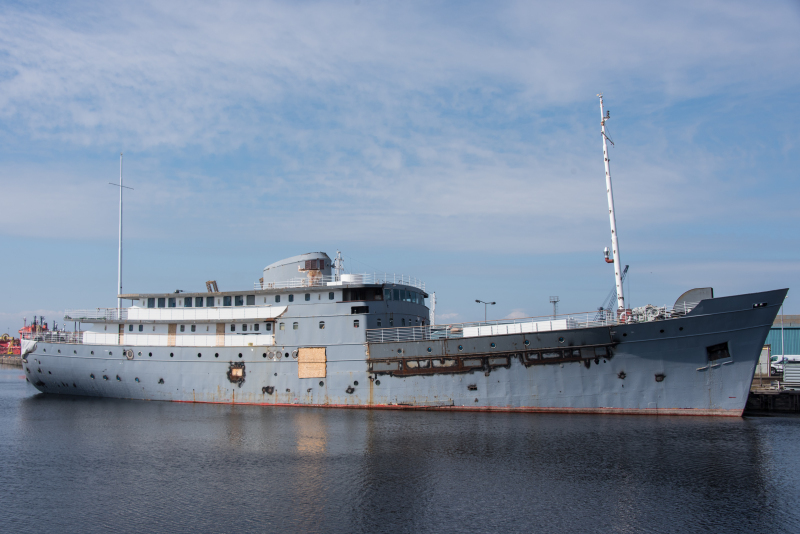 A third act as floating hotel might allow the FINGAL with its graceful lines, to continue its working life in good repair. At this point, the alternative is likely the scrap yard. I saw her in Rothesay Dock when she was new and what an impressive ship she was for her size. Everything about her was exemplary and a credit to the builders and the way her foremast was tapered was quite something. A really lovely looking ship. Conversion to hotel-ship due to complete later this year. That's one way to spoil a good looking ship!